Drugs and weapons aren’t the only contraband in prisons these days. The latest underground currency among inmates is an item most of us consider harmless: the cell phone. And so far, prison officials are fighting a losing battle to keep inmates from obtaining cell phones and using them to communicate with people both inside and outside prison walls. 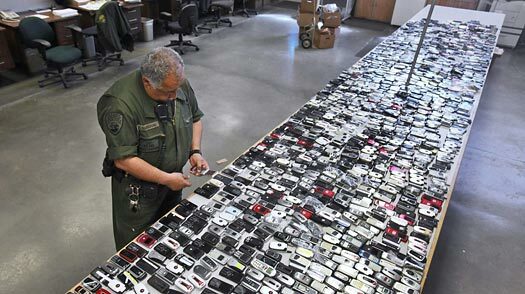 In California, home to the country’s largest state prison system, more than 2,800 cell phones were confiscated from inmates last year, double the number seized in 2007. But the problem isn’t limited to California. State and federal prisons across the country are grappling with what officials say is an epidemic of cell-phone use among inmates. In Texas, prison officials seized 549 cell phones from inmates in the first four months of this year alone. In California, a prison staff member admitted to earning more than $100,000 last year by selling cell phones to inmates. Prisons in Maryland, Virginia, California and Pennsylvania are using specially trained dogs to sniff out phones hidden inside cells and squirreled away in common areas. Florida and Maryland have instituted tougher penalties for anyone who provides a cell phone to an inmate, and other states are planning to follow suit. In many prisons, cell phones have become as valuable as drugs, if not more so. In a recent sting operation in Texas, an undercover officer was offered $200 by a prisoner for a cell phone and only $50 for heroin. California officials say inmates currently fork over between $100 and $400 to obtain a smuggled cell phone. It’s easy to understand why cell phones command such a premium. Unlike the one-time sale of drugs, an inmate can rent out the same phone dozens of times to fellow inmates. Inmates sometimes use cell phones to keep in touch with friends and family on the outside  collect calls made from inside prison facilities are notoriously expensive. But officials say inevitably cell phones are also being used to orchestrate crimes, harass witnesses, organize retaliation against other inmates and even order hits. A Baltimore man is accused of using a cell phone from prison to order an accomplice to murder a witness. ITT’s Intelligence and Information Warfare division is currently hawking a system called Cell Hound that detects all active cell phones within a prison facility and then displays the location on a computer monitor. The monitoring device can also be used to gather intelligence on other illegal activity among inmates. Last month, a Maryland investigation that included wiretaps on prison cell phones resulted in drug and weapons charges for two dozen people, including four state prison officers. But many prison officials believe the only surefire way to combat the problem is to jam cell-phone signals within prison walls. Yet any jammer for the slammer would run afoul of the Communications Act of 1934, which prohibits intentional interference with radio signals. Brady’s proposed bill would amend the act to permit targeted interference of mobile-phone service within prisons, while ensuring that emergency calls or other commercial signals near the prison aren’t affected. Brady says he hopes Congress will pass the bill by the end of the year. See TIME’s photos of prison life inside Baghdad’s Camp Cropper.